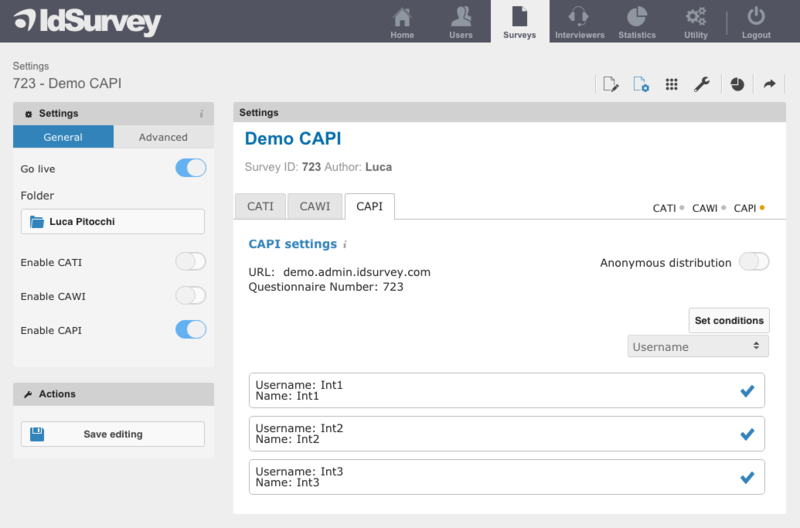 With IdSurvey you can complete CAPI interviews setting anonymous or authenticated distribution. In case of authenticated distribution you need to upload a contacts list from the Admin interface in “Contacts Management” page before starting with the survey. It is possible to assign CAPI contacts to specific interviewers associated with the survey, so that each interviewer can only process a portion of the contacts according to the parameters previously set. Create an Excel file with your contacts list. 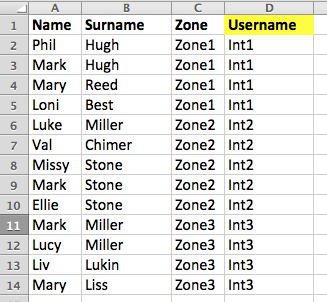 You need to import the database of contacts as an Excel file. For more information on this action, please check out the article of the Knowledge Base related to the import of a contacts list. In this file you can add all the information you need, creating as many fields as you want. In order to associate specific contacts to interviewers, it is mandatory to select a field where you can write the interviewer’s username that will be paired with the specific profiles (we usually suggest to use the “Username” field). Import the contacts file from the “Contacts Management” page following the instructions contained in the article “Importing a contacts list”. From the settings of the survey select the “CAPI” tab. Make sure to disable the anonymous distribution on the top right of the tab. Select the field where you entered the interviewer username from the dropdown menu under “Set Conditions” (in this example we selected the “username” field). Then click on “Set Conditions”. A blue flag should appear next to each interviewer’s profile confirming the action. Save your editing to assign CAPI contacts to interviewers and complete the procedure. Each interviewer will now be assigned to its portion of contacts. In this example, Int1 will be able to interview only the first four contacts, Int2 from the fifth to the eighth and so on.